Charles John Huffman Dickens was born in Portsmouth, England on February 7th 1812, the second of eight children. His family had a fairly humble lifestyle. Dickens became famous mostly for his literary works, which include Oliver Twist, A Christmas Carol, Barnaby Rudge, Nicholas Nickleby, David Copperfield, A Tale of Two Cities, Great Expectations, and The Old Curiosity Shop. Due to difficult family circumstances (his father was imprisoned), Dickens at age 12 was forced to find work in a dreary factory where he stuck labels onto cans of boot blacking. Even at an early age, he loved the theatre and even briefly considered a stage career, but due to a slight illness, he missed the audition. Throughout his life, he maintained a keen interest in theatre. He had a fascination for circuses, wax works, pantomimes, and ghosts. His father was released from prison in 1824 and Dickens enrolled at Wellington House Academy in North London to finish his education. He left school at age 16. Dickens began work as a law clerk then became a freelance reporter for a number of London newspapers. His writings on everyday London brought together by sketches by ‘Boz’ were published in 1836 for the Pickwick Papers. The Pickwick Papers was a specific project inspired by the adventures of gentlemen who were part of a sporting club. These were serialised from March 1836 to October 1837. 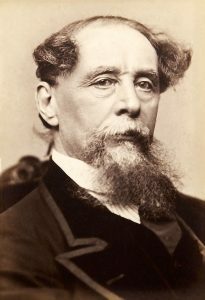 Dickens also wrote a few amateur plays from 1836, but he made his real foray into acting and producing plays in the 1850s. In April 1836, Dickens married Catherine Dickens who bore him 10 children. However, his marriage failed later on when he met the actress Ellen Ternan who became his mistress. In 1842, Charles Dickens became fascinated with magic after attending a performance of the Viennese stage magician Ludwig Dobler at St. James Theatre in London. Dobler was then regarded as a leading performer. 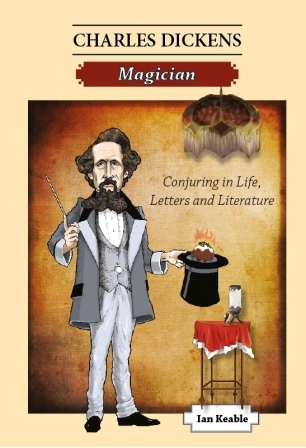 He greatly impressed Dickens so much so that soon afterwards, Dickens wrote to his American friend Cornelius Felton stating that he had purchased a conjuror’s ‘entire stock in trade’ and thought he might try his hand at becoming an amateur conjuror. Dickens gave his first magic show on his son’s birthday in January 1843. He continued to give magic performances for the next seven years and was known to have practiced assiduously. At about this time, Dickens had become quite the theatre buff and no doubt his stage experience would hold him in good stead as a conjuror. However before this, his real efforts were in writing novels. Upon completion of his novels, he began to give book readings in England that became hugely popular. He visited America in 1867 where he began to give more book readings to eager audiences and these stage readings were elegant in presentation. Salamanca and the Ocean Caves of Alum Bay. Wonder is the result of nine years seclusion in the mines of Russia. box at the command of the necromancers bidding. The pyramid boxes were probably a version of the Nest of Boxes, which is still a favourite trick of many magicians. Another effect that appealed to his audiences of the day was his vanish of a ladies watch locked in a strong box that would “fly into a half quanten loaf of bread.” His Travelling Doll that was prettily dressed was also made to vanish, leaving only the doll’s dress behind. Dickens and Forster above all exerted themselves till the perspiration was pouring down and they seemed drunk with their efforts! Only think of that excellent Dickens playing the conjuror for one whole hour—the best conjuror I ever saw (and I have paid money to see several)—and Forster acting as his servant! This part of the entertainment concluded with a plum pudding made out of raw eggs, raw flour—all the usual raw ingredients—boiled in a gentleman’s hat and tumbled out reeking all in one minute before the eyes of the astonished children and astonished grown people! That trick and his others of changing ladies pocket handkerchiefs into comfits (confectionery) and a box full of bran into a box full of live guinea pigs would enable him to make a handsome subsistence lest the bookseller trade go as it please. Although his period of performing as a conjuror was relatively short, Dickens made a point of seeing Robert Houdin perform while visiting Paris in 1854. He was also fascinated by the French mind reader Alfred de Caston and acknowledged he lacked the real talent of these two gentlemen. Once while on holiday on the Isle of Wight, a close friend John Leech got into difficulties while swimming, hitting his head on the rocks that left him dazed and unable to control his movements. Dickens was able to make use of his knowledge of hypnosis to place his friend into a long sleep. Upon waking, Leech found he had all his natural faculties once again. It is not often a person can achieve such a list of achievements as Charles Dickens did. He became a renowned novelist, playwright, editor, actor, hypnotist, story reader, and poet. He is mostly remembered as one of England’s greatest novelists, but it is pleasing to know that at least for a short while, he was also one of us—a conjuror and a brother in the history of magic. 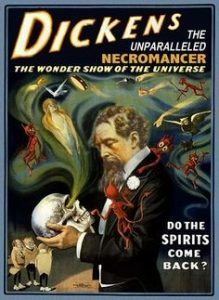 Dickens gave his last magic performance in Rockingham Castle in 1849 and he passed away in Higham, UK on June 9th 1870. He lies buried in the poets’ corner in Westminster Abbey.